This page is for the 1998 game. For the 2014 reboot, see Thief. TFix helps run the game on modern systems. TFix removes the CD check. An updated version of the original demos is available. Thief: Gold includes extra missions and some other enhancements. The original content can be played using GoldToDark. TFix updates the game with NewDark for modern systems. Also contains mission fixes and optional texture mods. The GOG release has an out-of-date, stripped-down version of this patch. Restart the current mission (or progress to the next one) after patch installation. Otherwise you may encounter various issues, such as torches that don't properly go out when extinguished. Add the line skip_intro to the file and save it. The Enhancement Pack 2.0 is an updated version of the original Enhancement Pack (which is included in TFix and is much less comprehensive). This contains higher quality reproductions of original textures and objects. Also works with Thief II: The Metal Age. The Necro Project pack is very similar to the Enhancement Pack 2, but focuses on giving the game a slightly darker, noir look. Somewhere between the EP2 and HD Mod in lore-accuracy. Also works with Thief II: The Metal Age. The Thief Gold HD Texture Mod adds new textures, effects and enemy skins to all original missions. Significantly alters the game's graphical style (far more than the two packs above). 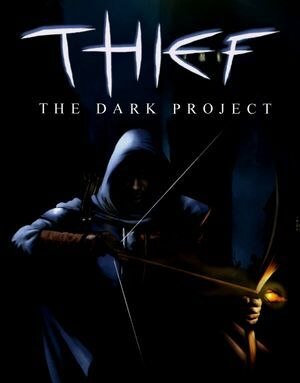 The mod is compatible with Thief: The Dark Project and Thief Gold. 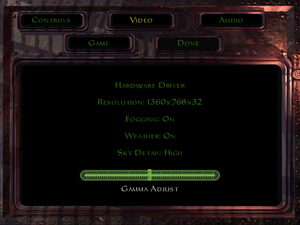 Includes a tool to configure advanced graphics settings (Anti-Aliasing, Bloom, etc.). An FAQ with installation steps is available. Configuration files are: cam.cfg (basic settings, resolution), cam_ext.cfg (NewDark advanced settings), cam_mod.ini (Mod and fan mission options), install.cfg and user.bnd (key bindings). Fan mission saves are kept in the mission's folder. In-game resolution settings (GOG.com version). For Windows 8 and later use TFix. In-game general video settings (retail version). In-game advanced video settings (retail version). Install TFix and set the resolution you want in-game. If your FOV is not detected correctly go to the installation folder and edit cam_ext.cfg. Change ;fov 90 to fov ## with the FOV you want. Save your changes and relaunch the game. Save your changes and set your chosen resolution in-game. For borderless fullscreen windowed mode choose the desktop resolution in-game. Installing TFix enables Vsync by default. Vsync can be disabled. Change ;vsync_mode 0 to vsync_mode 0 and save your changes. Change framerate_cap 100.0 to framerate_cap ### with the FPS you want. Change ;phys_freq 60 to phys_freq 60 and save your changes. No game-managed mouse acceleration. In addition, Windows mouse acceleration can be disabled in-game by adding use_raw_mouse_input to cam_ext.cfg. Default sensitivity is very high. Go to Options and set Joystick: On. In-game key map settings (1/4). In-game key map settings (2/4). In-game key map settings (3/4). In-game key map settings (4/4). In-game audio settings (GOG.com version). 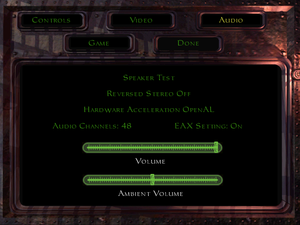 Master volume and ambient sound (usually controls background music in addition to atmospheric sound effects, like machinery). See EAX support. Up to 7.0 output. May require DirectSound 3D restoration software. Available since NewDark 1.22. Simply update the game with the latest TFix, go to this page, and follow the instructions. In the game go to Options, Audio, and change Hardware Acceleration to OpenAL. EAX can now be used. For subtitles use the New Thief Gold subtitles patch. See install/setup instructions. Alternatively see Helix Mod: Thief Gold. A detailed forum thread for technical difficulties is available on the Through The Looking Glass forum. Owners of the original disc version may encounter problems when attempting to install on modern operating systems. Go into the disc contents and find setup.exe. Right-click it and choose Properties. On the Compatibility Tab, enable Windows 95 compatibility mode and save your changes. Thief has frame rate issues in fullscreen mode on Windows 8 and later. A large number of Fan Missions, many of very high quality, have been produced for the Thief games. A categorised list is available here. 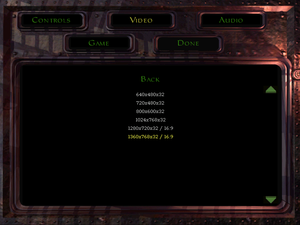 Some of the older FMs for Thief Gold and the Dark Project suffer compatibility issues when played with TFix/NewDark. An ongoing effort to preserve, test and fix these missions has resulted in a series of patches. Install TFix and ensure the installer option to create a shortcut to the FM Selector is checked. If you did not check this option, add the command line argument -fm on a Thief desktop shortcut or in the Steam interface. Start FM Selector using this shortcut. Select a folder for installed missions and an FM .zip archive path when prompted. Do not put the archive path inside the FMs folder or vice-versa, otherwise things will not work correctly. To install a mission, drop its .zip file (do not extract it) into your chosen archive path, start the selector, double click the mission/zip file name and select 'Ok'. It has now been extracted to the installed missions folder. Launch the mission by double clicking the name again. To launch the original game select 'Skip FM' in the lower-left corner. This mod provides cleaned up and resampled sound files for Thief Gold and Thief II: The Metal Age. The quality difference is particularly noticeable when wearing headphones. GoldToDark is a patch that will convert Thief Gold into the original Thief: The Dark Project. This must be used on a clean installation of Thief Gold. TFix can be installed thereafter and should correctly detect that you are using The Dark Project instead of Thief Gold. By default, Thief: The Dark Project has view bob that may cause motion sickness. Open <path-to-game>\cam_ext.cfg with a text editor. Find the line ;bob_factor 0.3. Remove the semicolon and set the value to 0. 6, 9 DirectX 9 requires NewDark/TFix. DirectSound, OpenAL OpenAL requires NewDark/TFix. The system requirements for NewDark/TFix- and by extension those for the GOG.com release- are higher than the original requirements listed here. ↑ 2.0 2.1 File/folder structure within this directory reflects the path(s) listed for Windows and/or Steam game data (use Wine regedit to access Windows registry paths). Games with Steam Cloud support may store data in ~/.steam/steam/userdata/<user-id>/211600/ in addition to or instead of this directory. The app ID (211600) may differ in some cases. Treat backslashes as forward slashes. See the glossary page for details.